PHOTO CAPTIONS: 1. 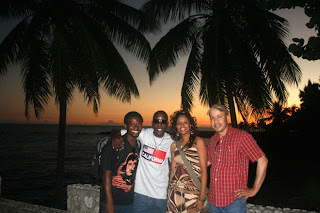 Malecon in Santo Domingo (Andre, Junior, Doris, Daniel), 2. 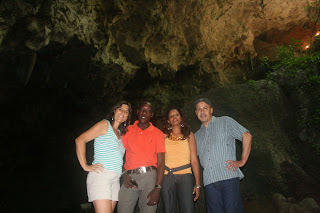 Los Tres Ojos caves (Chelsea, Junior, Doris, Daniel), 3. 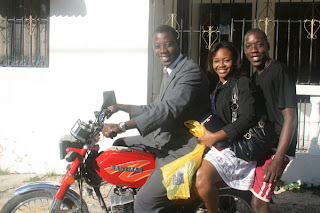 Junior dropped off his brother and sister-in-law at church with his new motorcycle, 4. Making music in the Children's Museum, 5. View of Santo Domingo, 6-9. 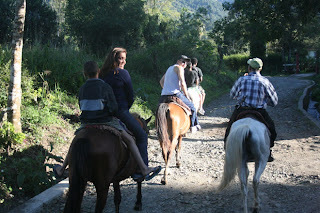 Riding horses to the falls in Jarabacoa, 10. 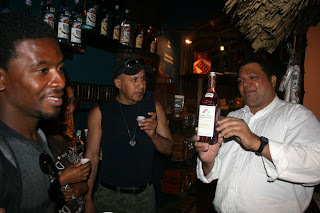 Sampling Mamajuana in the Amber Museum, 11. 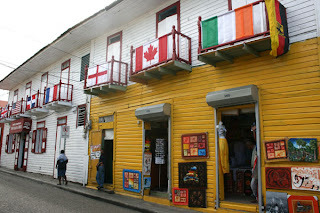 Puerto Plata Old Town, 12. Dominican kids enjoyed Andre's driving lesson, 13-14. Teleferico, 15. a beachside cafe in Cabarete. Andre and I arrived at the Santo Domingo airport, after three long flights and layovers from Sao Paulo, Brazil, around midnight on Jan. 11. We picked up the mini rental car and went to Junior’s house to sleep. The next day Junior, Andre and I drove back to the airport to pick up Daniel in the afternoon around 2:00. It was really great to see him. Daniel brought everything I’d asked him to – Maya’s hair, more ashes and some of her clothes. I really needed to touch and smell something of hers; Tom’s natural toothpaste, Colgate dental tape, and mini DV tapes for my video camera; dried mango, chocolate covered almonds, sugar-free gum, and other treats to give away as gifts; and a huge sports bag filled with deflated soccer balls, soccer shoes, shin guards, jerseys, children’s clothes, empty photo albums, and a Verizon phone to take to Haiti next week. Daniel checked into his hotel on El Conde, the touristy pedestrian zone in the Colonial district, then we gave him a quick walking tour of the area. Our friend Nena’s cousin Doris met up with us and we strolled along the malecón, (waterfront walk) on our way to one of our favorite restaurants. After dinner, we dropped Daniel at his hotel, then drove Doris home. On the way we encountered a common scene in Santo Domingo: a police checkpoint. I didn’t think much about it, except I was glad I had my passport with me. But they weren’t interested in me or Doris -- only the Haitian guys. While we females chatted and joked with a couple of the officers on our side of the car, three or four others pulled Andre and Junior out of the car, demanded their ID, searched their backpacks, and one of them grabbed Andre by the shirt, which really pissed him off. Haitian immigrants are a constant target for the police, usually looking to deport anyone without residency, which luckily our friends have. Before the situation escalated even more, Doris and I jumped out of the car and came to their rescue, sweet-talking everyone to calm down. Finally, without even demanding a bribe or stealing our cameras, the police let us go. The next day was Sunday. Doris picked Daniel up to go to church, in a fully-packed group taxi. 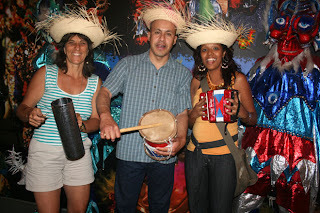 No one should visit the D.R. without that experience. Meanwhile, Andre and I spent the morning with Junior and his family in their house near the airport. When we picked up at church, Daniel surprised me by telling me how much he enjoyed it. The pastor had walked through the crowd and hit Daniel on the forehead. Immediately, Daniel felt calm and refreshed. He began to dance with the rest of the parishioners, filled with the Holy Spirit. We promised to join them next Sunday. The five of us went for lunch, then to the Tres Ojos caves (my 4th time, twice with Maya) and the Children’s Museum (my 3rd time). Daniel enjoyed everything, but realized that 8 days in Dominican Republic is nowhere near enough time. We packed so much into this short week; Daniel will be leaving the island with lots of memories. 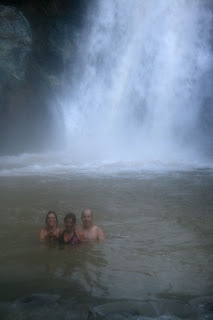 Our friend Lenni joined Andre, Daniel and me for a 5-day road trip. We started out in the mountains at the Gran Jimenoa Hotel. Swam in the pool, enjoyed the jacuzzi, played billards and ping pong, rode horses to the falls (4 hours in total) and ate lots of delicious Dominican food. 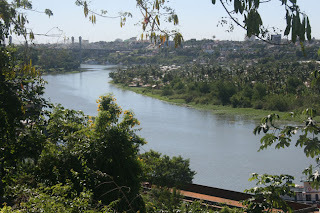 The recent hurricane destroyed the bridge, ripped out many trees, and removed most of the vegetation along the river, which had doubled in size and force. It’s still a beautiful place, full of happy memories with Maya. I’m sure this wasn’t the last time I’ll go there. 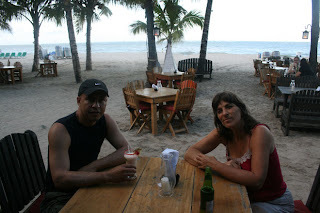 We drove to L’Oase Hotel near Puerto Plata where Andre and I stayed in October before going to South America. 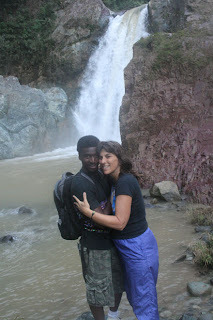 Our friends Joseph and Vashti welcomed us with warmth and laughter. The biggest attraction is the racquetball court that A-player Joseph built a few years ago. Now it has AC and a resurfaced floor. We’ve gotten in quite a few good games in the three days we spent here. 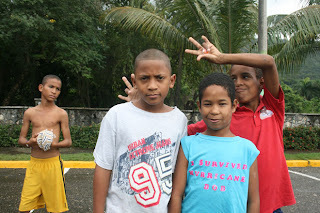 We went into Puerto Plata two times, took photos where I’d taken ones of Maya before. The plaza is still torn up and the main cathedral is being renovated as well. I feel sad realizing how everything changes and nothing is the same as when Maya was here. The small beach near Cabarete where Maya fed a litter of 8 puppies is getting ready for big-time development. Already they’ve added another road, started renting dune buggies, and the number of surf schools doubled from 3 to 6. Sunbathers lined the normally empty beach and kite surfers enjoyed the wind and waves as the sky filled with dark clouds. Maya’s puppies had a few litters themselves, so Kiko, their surfer owner, got them fixed. 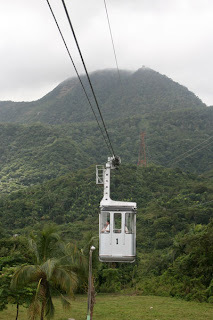 Maya never had the chance to take the Teleferico Italian-made cable car up to the Christ statue overlooking Puerto Plata at 2500 feet, but Andre and I did last time when we stayed at L’Oase. There’s a nice botanical garden all around the hilltop, but this time we cut our visit short because of drizzling rain. 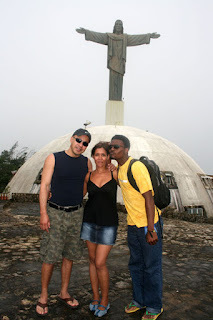 Like when Andre and I went up to the Christ statue in Rio, the views were very limited due to fog. Our rental car is an automatic, so I gave Andre his first driving lesson in the nearly empty parking lot of the Teleferico. At first he jerked us around a lot, but quickly got the hang of it. I cringed when his friend Junior had asked him if he weren’t embarrassed that his woman can drive and he can’t. But I got my license on my 16th birthday in 1973, four years before Andre was even born. I hope I know how to drive by now. Once he gets to California, he’ll be a pro too. Another must-see for Daniel was the German bakery I raved about in Sosua. We stocked up on dark bread, streudel, cheesecake, pretzels, and cookies and cupcakes for Lenni’s daughters who she called every day. Lenni had promised them she’d be home Friday night, so we left her at the Caribe Tours bus station in the afternoon. Daniel, Andre and I will make the four-hour drive back to the capitol today.